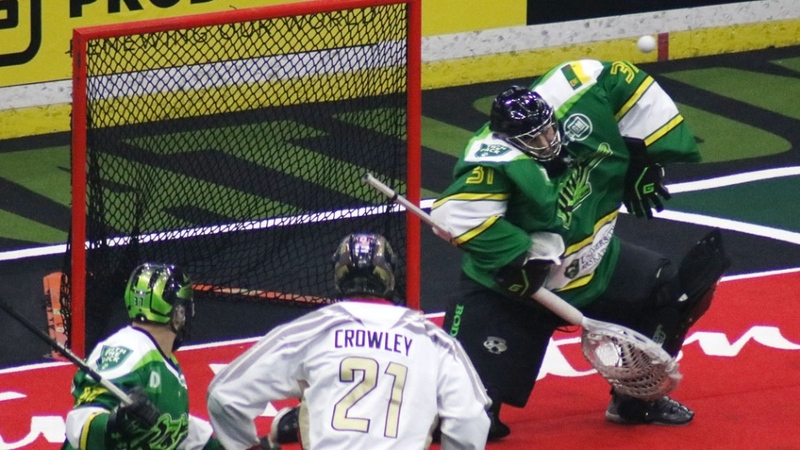 The Saskatchewan Rush picked up two big wins over the weekend to put them in the driver’s seat to finish in first place in the National Lacrosse League’s West Division. 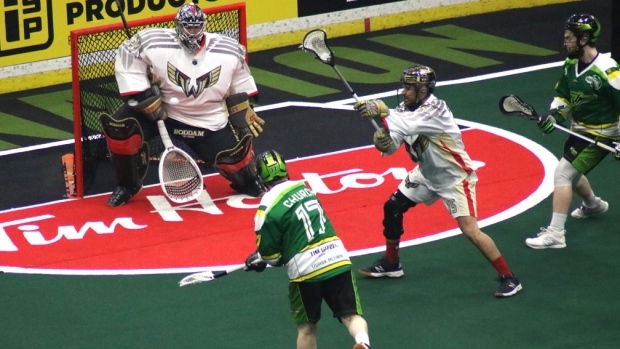 Mark Matthews and Ben McIntosh each had five goals to lift the Rush to a 16-11 win over the expansion Philadelphia Wings on Saturday night at the Sasktel Centre. “We are playing really well right now. It wasn’t easy to get our legs under us tonight defensively, especially against like I said they are a tough team. They have big bodies on offence, it’s tough,” Rush head coach and general manager Derek Keenan said after the game. It was a grueling grind for the Rush, after playing in San Diego the night before. The team caught a bus to the airport at about 4:30 a.m. Pacific Time to catch a flight at 6:30 a.m. to Phoenix. After a lengthy layover, the Rush caught a flight out of Phoenix to Saskatoon. The Rush landed in Saskatoon and arrived at the arena at around 4 p.m. for the 7:30 p.m. ball drop. The game was kept close in the first half as both teams exchanged goals, but it was McIntosh’s power play marker at 14:38 of the second quarter gave the Rush the lead 8-7 at the half. The difficult travel schedule started to take its toll on the Rush in the third quarter. After McIntosh scored his hat trick goal 26 seconds into the third, the Wings went on a four-goal run with single goals from Jordan Hall and Kevin Crowley and Matt Rambo scoring a pair. Down 11-9 heading into the final frame, Saskatchewan found a second wind to outscore their opponents 7-0. Scoring for the Rush was Matthews with three, McIntosh with two and singles from Matthew Dinsdale and Kyle Rubisch. Adam Shute got his sixth start of the season in goal for the Rush and stopped 53 of 42 shots for the win. Before defeating the Wings, the Rush was in San Diego in the battle for first place in the West Division against the Seals on Friday night. McIntosh scored a sock trick (six goals) as Saskatchewan downed San Diego 14-8. The win also gives the Rush the season series 2-1 in case of a tie in the standings. “It just seemed like the ball had eyes for me this weekend. I’m not going to question it,” McIntosh said. It was a defensive battle in the first half as Saskatchewan held a 3-2 lead after two quarters of play. Scoring for the Rush was Brett Mydske, Curtis Knight and McIntosh. 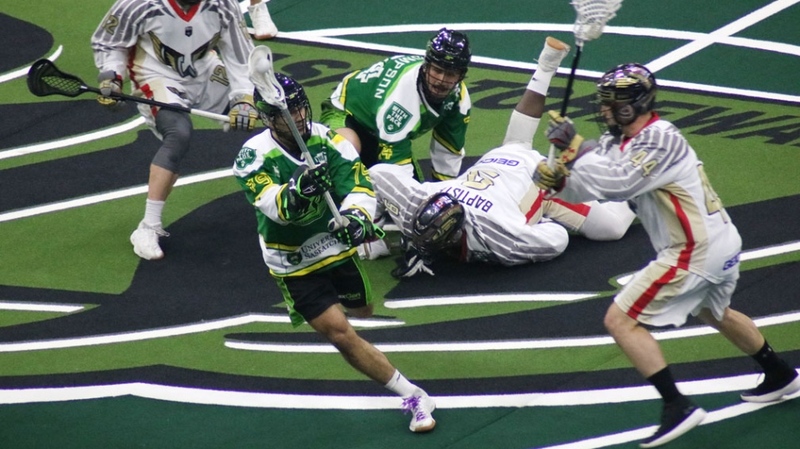 Between the 12:24 mark of the second quarter and 8:13 of the third quarter, Saskatchewan scored seven straight goals to take a 7-2 lead and would hold on for the victory. Saskatchewan now sits in first place, one game up on San Diego for second and a game and a half up on the Calgary Roughnecks for third. The Rush is back in action on April 20 when they head to Calgary to meet the Roughnecks. A Saskatchewan win would clinch first place for the Rush.